Since these are becoming more commonplace and with the recent advancements in making homemade RGB/Comp boards I figured we might as well have a thread for these rather than clutter up some others. I bought a TM-H1950GC last month and it was shipped upside down. 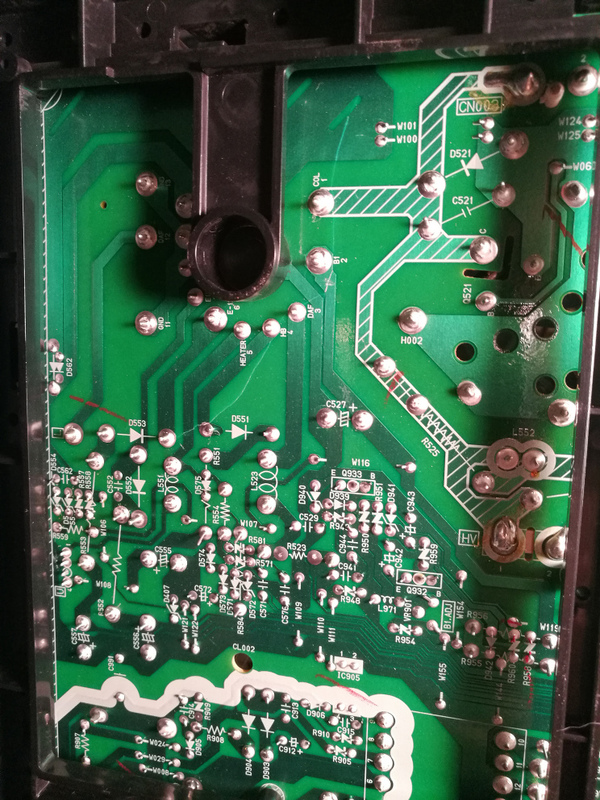 I've finally had a chance to sort out why it wasn't working and it turns out, the board was cracked under the flyback, breaking some traces. I also found a circuit diagram for the mainboard of a TM-H1900G which appears to be mostly identical to my 1950. I also got a 1700 chassis service manual. Last edited by Einzelherz on Tue Jul 25, 2017 4:11 pm, edited 2 times in total. Has anyone added RGB to TM-1700PN or TM-2100PN monitors? Was the difference noticeable? Just less bleeding on reds? On my sets the S-video quality is so good that I haven't felt the need to upgrade them. On my tm-h150cg the main noticeable difference between svideo and rgb is at the left and right edges of the screen. If you look closely you can see something that looks like color bleed into the overscan area. I saw it on the 1950 as well in svideo but haven't put the rgb card in it yet. It might be worth the hassle (if doable) for purists but at a sitting distance there's like a couple percent difference in quality. My repair worked and the results turned out pretty great! I still need to adjust the geometry and calibrate it, but I'm pleased. Also need to model and print up a new power button because it's a terrible not-quite live hinge design that breaks easily. Heh, that's why I picked it. I used to wear a t shirt I made with that screenshot cause it's so great! I think the board cracked because it was shipped upside down. That's right under the flyback which is the heaviest mounted part so the jostling of shipping probably caused it. Minor questions for DT-V owners - does yours make a loud clack when changing resolutions or even resetting a console? Also what's that tally light for? Mine never lights up. It's probably blurrier on the edges because it's flat. I wouldn't worry too much about that. And the thickness/pronouncedness of the blank lines is from the difference between the shadow mask on the 150 and the aperture grille on the DT-V. I have no idea what the tally lamp is for but it's not used with our applications. How many hours on it? Mine also does it especially while it's still warming up. After half an hour of operation it gets quiet . Do yours also do the loud clunk and picture shaking when switched on from cold? The shaking stops in matter of seconds and then it stabilises on mine. Mine has low hours so it's not due to wear.. glad to hear it gets quieter after warming up! The clunk/shaking when switched on is normal, it's the degausser doing its job. Happens on many CRTs and can get much louder than that on some sets.. The light is normaly when you remote the monitor. I have the loud clack on all my dt-v, i think its come from the s-correction card. my ikegami 1990r have also a sound but not as loud. Xer Xian, what are the second and third games in your screenshots? Those are Community Pom (mid-gen PS1 adventure RPG) and Soukyugurentai/Terra Diver..
Soukyou is the business. Worth a play on Saturn. I have it but haven't touched it in ages. I noticed this monitor (DT-V 1710cg) doesn't really like 54hz arcade games like R-type or Mortal Kombat series. (via groovymame, not PCB) Sometimes the picture will roll, and other times the picture will be stable but it will be small and squashed. This monitor also doesn't like to be in TATE mode. The screen gets purple blobs on it that won't go away with degaussing, but will go away once the monitor is rotated back to it's normal sitting position and left powered off for a little while. This is disappointing because this would be perfect for a desktop TATE setup. It's an aperture grille screen so I wouldn't personally TATE it anyway. And it's not multisync like an arcade monitor. It does broadcast resolutions, so PAL, NTSC, (SDTV) and 720p, 1080i. That means scan frequencies of 48, 50, 59.94, and 60 hz only. The PVM 20L5 I used to have had no problem with 54hz games, and it accepts all the same resolutions that the JVC does. The JVC is just more picky about the signal I guess. why wouldn't you rotate an aperture grille monitor? Just curious. I don't like perpetuating the stereotype, but at least with the TM-H vs. PVM comparison, the Sonys are ridiculously overbuilt, so I could see them being more accepting of non-standards. I've never tried off frequencies, personally. Gravity is what makes me paranoid about TATEing an aperture grille. Whereas a shadow mask is a perforated piece of steel in the front of the tube, the wires in an aperture grille make me uneasy sitting horizontal for extended lengths of time. I know they usually have a crosswise stabilization wire but that's just not enough to satisfy my concern. It's entirely my personal issue and many here have reported no issues with them, but that's specifically why I waited out some TM-H screens. This monitor also doesn't like to be in TATE mode. The screen gets purple blobs on it that won't go away with degaussing, but will go away once the monitor is rotated back to it's normal sitting position and left powered off for a little while. This is disappointing because this would be perfect for a desktop TATE setup. After you rotated your monitor, did you leave it alone for a while before turning it on? When you rotate a CRT you are changing its position wrt the earth's magnetic field and there's a chance that artifacts such as those you descripted will show up. If you let it rest for a bit before use you should be good. As for rotating aperture grilles, I myself have never experienced or heard of damages to the damper wires due to TATE'ing, but I think I'll keep my DT-V17 with standard orientation and rotate my TM-H150 anyway - it's just the most logical arrangement. Yeah, I even left it rotated and unplugged all night and tried again the next day and the blobs were still there. It's been a few years since I last tried it, so I may try it again once I get it out of storage. So, now I'm curious, anyone that has a composite / svideo card could open it and take pics ? there more on this one . i know that a french jvc agreed reparator still have one, paid mine 56€ from him, he find it after i come. Dont know if he can ship it. I still got mine sitting in the closet for about 2 years now after i bought it without the card. I saw in the other thread that they have been able to duplicate the card but its beyond what i can do. Anyone ever tried a Pc Engine on the DT-V series?